No music in this one, unless you want to cry, “96 Tears”. Back in the early Silver Laughter days, I was reminded by Kim that when I joined the band, I had brought a little sailboat with me. It was one we had while living in Colorado. My ex-wife and I had sailed it on Boulder Reservoir. So when we split up, I got the boat. Kim told me he remembered Carl, who had been in the Navy, having trouble sailing the little dingy on the lake in Worthington. I do not know what happened to it, but since it was constructed of Styrofoam, I imagine it eventually disintegrated. Last Christmas Janis and I bought a 24′ power boat; a 2002 Four Winns Horizon 240. This week we took our first trip with the boat and arrived safely in Tahoe. We took it out on several runs. Most memorable was our trip to Emerald Bay where we beached it and had lunch. But because the smoke from the rim fires in Yosemite made seeing and breathing almost impossible, we decided to head home a couple of days early. As it turns out, it was probably a good thing. A mixed blessing. Just as we approached Sacramento coming out of the mountains, one of the trailer wheels of the double axle on the passenger side came loose and started burning rubber! We quickly pulled over to the side of the road and from there it was a three hour ordeal to get a tow truck to haul us to the only repair shop that was open for the Labor Day Holiday! The story we got was all the trucks that were big enough to handle the tow were up in the mountains moving fire equipment! Fortunately there was ONE left in the area. 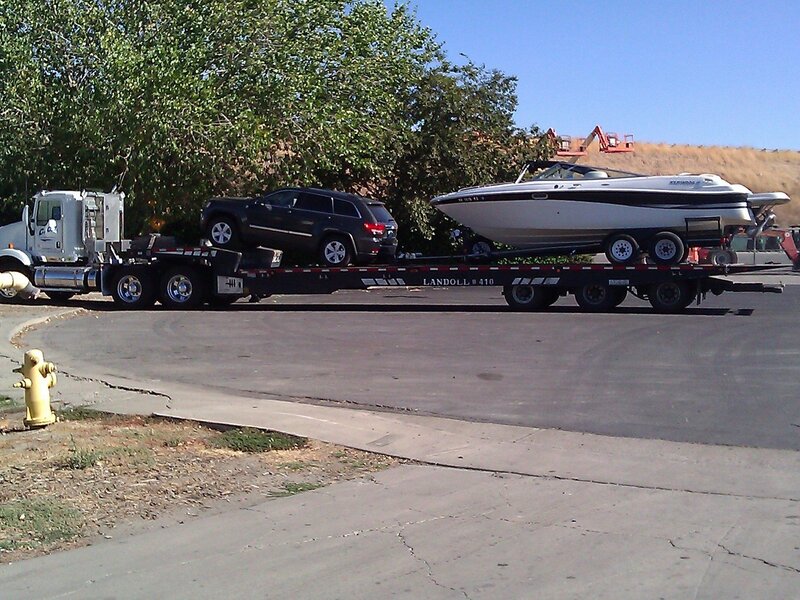 The picture shows the truck with our Jeep Grand Cherokee on the bed with the boat and trailer in front of the repair shop! The broken axle is on the other side of the trailer. We are told the word “boat” is an acronym for “Break Out Another Thousand”! I am beginning to believe it.